No. 1 seed Honokaa blasted past No. 4 St. Anthony to earn a berth in Saturday evening’s Division II state championship game. Honokaa will face No. 2 Kapaa, who edged past HPA, 2-1, in the other Division II semifinal. 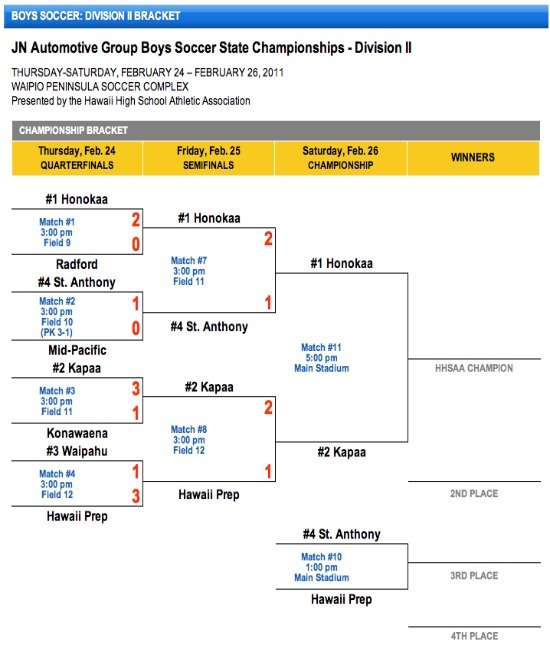 HPA and St. Anthony will play for third place overall. Also in Division II, Konawaena topped Waipahu, 2-1, and meets Mid-Pacific for fifth place overall. 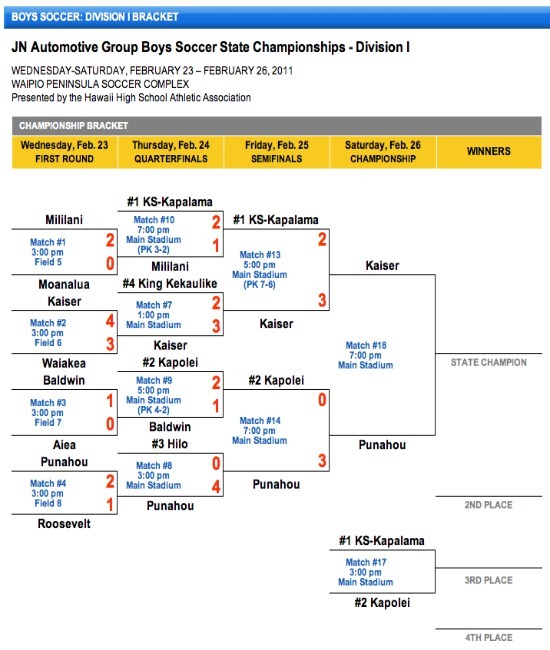 In Division I, the championship game pits Kaiser and Punahou. In semifinal action Friday, Kaiser knocked off No. 1 Kamehameha Schools Kapalama, 3-2 in penalty kicks, and Punahou rode over No. 2 Kapolei, 3-0. Hilo dropped Baldwin, 2-1, and plays Mililani for 5th place overall, while Waiakea takes on Roosevelt after knocking off Moanalua, 4-1, and could earn seventh place overall. OC16 has live coverage of the Division II and I championship matches at 5 p.m. and 7 p.m. Saturday, Feb. 26, respectively.